About 90 years after his creation of the famous Mickey Mouse, Walt Disney’s legacy continues to entertain children and adults alike around the world. Disney was listed as the strongest, most powerful brand in the world in 2018. Ranked as the joint-fourth most reputable company in the world closely behind the internet company, Google, the Walt Disney Company is not only a strong and well-recognized brand, but it is also a quite profitable one. In total, the company generated more than 55 billion U.S. dollars in revenue in 2017. Initially founded as a cartoon studio in 1923, the Walt Disney Company has grown and diversified on a large scale, operating in such industries as media networks, parks and resorts, studio entertainment and consumer products. 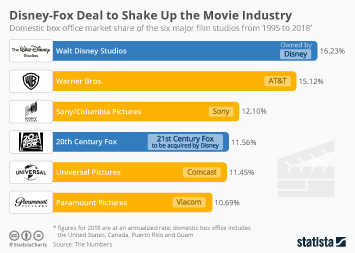 The Walt Disney’s media network business is the most profitable division of the company, accounting for over a third of Disney’s total global revenue in 2017. The Disney Channel, ESPN, History, Lifetime, A&E, FYI, LMN are a few examples of Disney-owned channels. The Walt Disney Company is also one of the leading film studios in the world, as the company is responsible for some of the most expensive movie productions in the industry, and some of the most hotly-anticipated titles. The Walt Disney Studios owns The Muppets Studio, the highly successful Pixar Animation Studios and Marvel Entertainment, as well as George Lucas’ Lucasfilm. Walt Disney was intent on entertaining off-screen as well as on-screen. With 150 million attendees in 2017, Disney is by far largest amusement park chain in the world and, in 2015, made about four times more revenue than its closest competitor, Overseas Chinese Town (OCT) Parks China. Aside from the park and resort business, Disney also has a strong presence in the cruise industry. American travelers rated Disney as the best large-ship cruise line, and the sixth best midsized-ship cruise line in 2017. In the consumer market, Disney is the leading company in licensed merchandise worldwide in 2017. Disney Consumer Products’ global retail sales stood at 53 billion U.S. dollars in 2017; Meredith, its closest competitor in the market, registered a total of 23.2 billion U.S. dollars in sales during the measured period. In 2017, the Walt Disney Company’s revenue from consumer products was about 3.26 billion U.S. dollars in licensing and publishing, and about 1.58 billion U.S. dollars in retail and other segments. Topic: Film industry in the U.S.
Topic: Television in the U.S.
More interesting topics from the industry "Radio, TV & Film"